Mesenchymal stem cells (MSCs) can make several types of cells belonging to our skeletal tissues, such as cartilage, bone and fat. Scientists are investigating how MSCs might be used to treat bone and cartilage diseases. Some MSC research is also exploring therapies for other diseases, but the scientific basis for these applications has not yet been established or widely accepted. Mesenchymal stem cells (MSCs) are multipotent stem cells found in bone marrow that are important for making and repairing skeletal tissues, such as cartilage, bone and the fat found in bone marrow. These are not to be confused with haematopoietic (blood) stem cells that are also found in bone marrow and make our blood. MSCs make up a very small fraction of all the cells in our bone marrow, but researchers have been able to isolate MSCs so they can be studied. Recent studies have suggested that MSCs are important for creating a niche environment or ‘home’ for blood stem cells in bone marrow. MSCs treatments are being developed to help repair bone and cartilage, such as injuries to the knee meniscus or long-term accumulated damage that leads to osteoarthritis. Studies are further investigating reports that show MSCs help new blood vessels form in damaged tissue. This could have major implications for fixing tissue damaged by heart attacks and diseases. Researchers are also examining the ability of MSCs to reduce inflammation, slow the progression of autoimmune diseases and prevent transplant rejection. Stem cell research is complex, detailed, slow and difficult. Conflicting results in early (and present day) MSC research are a reminder that stem cell research takes time to get right. There is still a large amount of uncertainty in how MSCs can be successfully delivered to damaged tissues in the body. Often, transplanted MSCs are rapidly removed from the body, which limits their ability to be used for treatments. Researchers are working to develop ways of holding MSCs in place and encouraging them to develop new cartilage or bone. Mesenchymal stem cells (MSCs) are an example of tissue or 'adult' stem cells. They are ‘multipotent’, meaning they can produce more than one type of specialized cell of the body, but not all types. MSCs make the different specialized cells found in the skeletal tissues. For example, they can differentiate − or specialize − into cartilage cells (chondrocytes), bone cells (osteoblasts) and fat cells (adipocytes). These specialized cells each have their own characteristic shapes, structures and functions, and each belongs in a particular tissue. Some early research suggested that MSCs might also differentiate into many different types of cells that do not belong to the skeletal tissues, such as nerve cells, heart muscle cells, liver cells and endothelial cells, which form the inner layer of blood vessels. These results were not confirmed in later studies. In some cases, it appears that the MSCs might have fused together with existing specialized cells, leading to false conclusions about the ability of MSCs to produce certain cell types. In other cases, the results were an artificial effect caused by chemicals used to grow the cells in the lab. Mesenchymal stem cell differentiation: MSCs can make fat, cartilage and bone cells. They have not been proven to make other types of cells of the body. MSCs were originally found in the bone marrow. There have since been many claims that they also exist in a wide variety of other tissues, such as umbilical cord blood, adipose (fat) tissue and muscle. It has not yet been established whether the cells taken from these other tissues are really the same as, or similar to, the mesenchymal stem cells of the bone marrow. The bone marrow contains many different types of cells. Among them are blood stem cells(also called hematopoietic stem cells; HSCs) and a variety of different types of cells belonging to a group called ‘mesenchymal’ cells. Only about 0.001-0.01% of the cells in the bone marrow are mesenchymal stem cells. It is fairly easy to obtain a mixture of different mesenchymal cell types from adult bone marrow for research. But isolating the tiny fraction of cells that are mesenchymal stem cells is more complicated. Some of the cells in the mixture may be able to form bone or fat tissues, for example, but still do not have all the properties of mesenchymal stem cells. The challenge is to identify and pick out the cells that can both self-renew (produce more of themselves) and can differentiate into three cell types – bone, cartilage and fat. Significant advances have now been made in this direction. Interestingly, studies in humans have for once paved the way to similar studies in the mouse. Both types of studies have converged in identifying the non-hematopoietic (blood) stem cells in the bone marrow (widely called "mesenchymal" stem cells) as "skeletal" stem cells. This is a better term, because all the cell types that these cells can generate are indeed found in the tissues that together make the skeleton (bone, cartilage, fat in the bone marrow cavity of the bones). One very intriguing development reads that the "skeletal" stem cells seem to to provide a "niche" or home for the other type of stem cell, the hematopoietic (blood) stem cells. Both would live together in contact with each other close to the blood vessels of the bone marrow. No treatments using MSCs are yet available. However, several possibilities for their use in the clinic are currently being explored. Other research is focussed on using MSCs to repair cartilage. Cartilage covers the ends of bones and allows one bone to slide over another at the joints. It can be damaged by a sudden injury like a fall, or over a long period by a condition like osteoarthritis, a very painful disease of the joints. Cartilage does not repair itself well after damage. The best treatment available for severe cartilage damage is surgery to replace the damaged joint with an artificial one. Because MSCs can differentiate into cartilage cells called chondrocytes, scientists hope MSCs could be injected into patients to repair and maintain the cartilage in their joints. Researchers are also investigating the possibility that transplanted MSCs may release substances that will tell the patient’s own cells to repair the damage. Many hurdles remain before this kind of treatment can become a reality. For example, when MSCs are transplanted, most of them are rapidly removed from the body. Researchers are working on new techniques for transplanting the cells, such as developing three-dimensional structures or scaffolds that mimic the conditions in the part of the body where the cells are needed. These scaffolds will hold the cells and encourage them to differentiate into the desired cell type. Some studies in mice suggest that MSCs can promote formation of new blood vessels in a process called neovascularisation. MSCs do not make new blood vessel cells themselves, but they may help with neovascularisation in a number of ways. For example, they may release proteins that stimulate the growth of other cells called endothelial precursors – cells that will develop to form the inner layer of blood vessels. They may also "guide" the assembly of new blood vessels from preexisting endothelial cells (those that line the blood vessel). Such studies on animals have led researchers to hope that MSCs may provide a way to repair the blood vessel damage linked to heart attacks or diseases such as critical limb ischaemia. A number of early stage clinical trials using MSCs in patients are currently underway but it is not yet clear whether the treatments will be effective. Several claims have been made that MSCs are able to avoid detection by the immune system and can be transplanted from one patient to another without risk of immune rejection by the body. However, these claims have not been confirmed by other studies. MSCs are rejected like any other "non-self" cell type. It has also been suggested that MSCs may be able to slow down the multiplication of immune cells in the body to reduce inflammation and help treat transplant rejection or autoimmune diseases. Again, this has yet to be proven and much more evidence is needed to establish whether MSCs could really be used for this kind of application. Research into therapies using MSCs is still in its infancy. A great deal more work is needed before such therapies can be used routinely in patients. These may in principle harness both the ability of these cells to generate skeletal tissues, or the ability of these cells to direct the function of hematopoietic and vascular cells. Questions remain about how the cells can be controlled, how they will behave when transplanted into the body, how they can be delivered to the right place so that they work effectively and so forth. By studying how these cells work and interact within the body, researchers hope to develop safe and effective new treatments in the future. This factsheet was created by Clara Sanz Nogués and Mikey Creane and reviewed by Paolo Bianco. 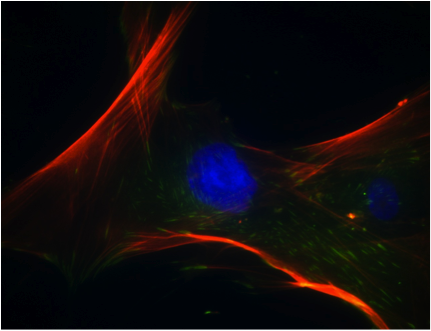 Human MSCs image (lead image) by Marc Healy, NUI Galway. Diagrams and human MSCs photograph by Clara Sanz, NUI Galway. Stained undifferentiated and differentiated MSC images reproduced from Mesenchymal stem cells: Clinical applications and biological characterization, Int J Biochem Cell Biol (2004) 36 (4): 568-584 with permission from the authors and from Elsevier. Human mesenchymal stem cells grown in a single layer on the bottom of a flask; 4x magnification. The colour is from a stain called Nile red O that marks fat cells red. Cartilage cells are stained red using the dye Safranin O.